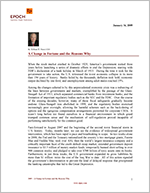 A Change in Fortune and the Reasons Why - Epoch Investment Partners, Inc. When the stock market crashed in October 1929, America’s government waited three years before launching a series of dramatic efforts to end the Depression, starting with FDR’s declaration of a bank holiday in March of 1933. During the time it took for the government to take action, the U.S. witnessed the worst economic collapse in its more than 150 years of history. Banks failed by the thousands, deflation took hold, economic output declined by one third, and unemployment among adult males reached 25%. Among the changes ushered in by this unprecedented economic crisis was a redrawing of the lines between governments and markets, exemplified by the passage of the Glass-Steagall Act of 1933, which separated commercial banks from investment banks, and the formation of important regulatory bodies such as the SEC and the FDIC. Over the course of the ensuing decades, however, many of these fiscal safeguards gradually became undone: Glass-Steagall was abolished in 1999, and the regulatory bodies exercised increasingly poor oversight, allowing for harmful schemes such as the back-dating of options and the egregious compensation arrangements permitted for corporate CEOs. It wasn’t long before we found ourselves in a financial environment in which greed trumped common sense and the mechanism of self-regulation proved incapable of performing satisfactorily for the common good. Fast-forward to August 2007 and the beginning of the second worst financial storm in U.S. history. Today, months later, we can see the evidence of widespread government intervention, which has been rapid in pace and breathtaking in scope. In two weeks alone in 2008, the Fed and the Treasury nationalized the country’s two mortgage giants, Fannie Mae and Freddie Mac; took over AIG, then the world’s largest insurance company and a critically important facet of the credit default swap market; extended government deposit insurance to $3.5 trillion of money market funds; temporarily banned short selling in over 900 common stocks; and pledged to take over $700 billion of toxic assets onto its books. Furthermore, in just three weeks, the U.S. government expanded its gross liabilities by more than $1 trillion: twice the cost of the Iraq War to date. All of this action signaled the government’s determination to prevent the kind of delayed response that precipitated the banking catastrophe that led to the Great Depression. And now the big question: Will it work? Probably, but it’s too early to know for sure. If we look at measures such as the TED spread and LIBOR, we can conclude that a large measure of liquidity has returned to the banking system as a result of government initiatives and guarantees (See Figure 1). However, the insolvency issues surrounding the bursting of the credit bubble, which began in the housing sector and have spread elsewhere, are still worsening. Figure 2 shows the current composition of these liabilities as estimated by several organizations, including the IMF. As for the economy’s eventual recovery, household balance sheets in the U.S. must be repaired before normal cyclical mechanisms can start functioning again. The huge amount of outstanding household debt, as reflected in Figure 3, is estimated to equal 20% of consumers’ annual disposable income. When wage growth is weak, as it is currently, the only way to rebalance the budget is to cut discretionary spending. Until housing prices bottom – which, in our view, should occur in 2010 – the recovery of the American consumer cannot be estimated with much certainty. The liability side of the balance sheet will continue to worsen for both consumers and the financial institutions that facilitated consumers’ indebtedness. Over the past fifteen months, there has been an earthquake in the financial sector, which has triggered a tsunami that will pummel the shores of every country in the world. Today, over one-third of all goods and services produced in the world are traded, which means the fates of all countries are unavoidably integrated. As a result, it is safe to say that the impending global contraction of output is likely to be the worst since World War II. In the U.S., we will witness real GDP contraction of 5-6% for a period of several months and unemployment in excess of 9% by mid-2009. These changes will be uncomfortable for most, dire for some. That said, we can take some comfort in the knowledge that most of these trends are now widely known and that steps have been taken in all developed countries, plus China, to address them. Policy coordination still leaves much to be desired but, in today’s global marketplace, no one has a vested interest in seeing the system fail, which already puts us one step ahead of the 1930s. What is different this time around? To begin to formulate an answer, I would like to hearken back to my first year of graduate school, which, I have to admit, occurred more than 40 years ago. Back then, I learned a “truth” that went something like this: If you can accurately describe a problem, the solution is inherent in the description. But if you fail to arrive at the correct description, your solution will more often than not fall short. With this axiom in mind, let us look at the world from the perspective of global liquidity, a concept put forth by David Roche of Independent Strategy several years ago. Figure 4 shows liquidity as an inverted pyramid. At the bottom is “power” money or reserves that exist on the balance sheet of central banks. Above this slice is the money created through the conventional credit multiplier mechanism of commercial banks. Sitting on top of that tranche is liquidity created by securitization. Securitization is a big topic these days. Supposedly, securitization allowed risk to be pooled and averaged (lowering specific risk exposure but inevitably raising systemic risk over time) thereby allowing claims on illiquid assets to grow further relative to the reserve money in the system. Finally, at the top of the pyramid are credit and interest rate derivatives: mechanisms by which financial institutions, via the process of “insuring” against losses, were able to further increase their claims on physical and financial assets without increasing reserves of either capital or reserve money. It is easy to see that the process of securitization and the creation of the credit and derivative systems amounted to a huge monetary printing press. As a result, a “shadow” banking system was formed that existed outside of the conventional system of monetary policy and control, allowing for a massive expansion of the value of claims on assets, goods, and services. It is important for the reader to understand that money created at the top of the liquidity pyramid (i.e. within the “shadow” banking system) is no less real than money created in the form of notes, coins, or deposits held at commercial banks at the bottom of the pyramid. In a fiat currency system such as ours, money is nothing more than a claim on assets, goods, and services. All “dollars” are equal, regardless of their source in the pyramid. Thus, when the deleveraging process started, it affected the entire pyramid. What makes the severity of today’s financial crisis so difficult to gauge is that some of the pyramid – its largest portions, in fact – did not exist in the 1930s. Therefore, our current tsunami of credit contraction is much, much larger than the contraction of the early 1930s and will require very bold and original initiatives to offset it. This set of circumstances is very different from those of the past, not only because of our system’s outrageous size, but because of the immense economic complexity that facilitated the credit market’s rise and ensured its eventual downfall. Today, money is literally being destroyed. While loose regulations, low interest rates, and many other factors (including ignorance at the central bank and regulatory agencies) allowed the pyramid to expand, at the belly of the beast was a growing appetite for risk that was further whetted as the economic boom expanded. Once the recession started, the appetite for risk suddenly shrunk. When confidence in the continuation of the economic expansion was shaken, risk pooling and credit insurance processes failed, and money, defined as we have here, started disappearing at an alarming rate. Today, we have M shrinking and V slowing. A recession is inevitable under these circumstances, and, if we buy David Roche’s concept of money, the recession could be long and deep. Now, we are challenged with predicting a bottom for the equity market. At the present time, there are many signs that say the market is presenting itself as a value, if not a trough. Equity yields (E/P ratios) are more than double that of ten year U.S. Treasury bonds, representing a post-war high that, by all historical evidence, would mark a bullish environment for equities. Equity values to GDP are closer to post-WWII lows at the present time (65%) than in many years. At the time of this writing, cash on the sidelines is estimated to be nearly $9 trillion or almost 75% of the market value of U.S. equities. A dollar invested today in the S&P 500 buys nearly twice the value in equities that a dollar invested 15 months ago would have purchased. All of these facts shed some interesting light on our current predicament, and cause us to be cautiously optimistic that, beginning sometime in the next few quarters, a bottom will be reached. The voyage to the bottom, however, will be anything but pleasant. The sheer scale of the pyramid would suggest the liquidity destruction underway is difficult to overcome simply by a display of brute force from the central banks. Zero percent interest rates are not enough. Risk appetites must change. The pace at which the pyramid is shrinking from the top must slow before the supply of liquidity can start to rise. We should cross this point in 2010, and it will be visible in a variety of economic price series. At that time, deflation may well have run its course. 2009 will be a tug of war between the collapsing pyramid and the initiatives pushed forward by the policy-making bodies around the world. The recessionary forces have a head start, and therefore we expect 2009 to be difficult. Defense will continue to be a winning strategy with an emphasis on dividends, quality balance sheets, and free cash flow generators. True catastrophe should be avoided, but a bull market is unlikely to start until 2010. In conclusion, it is gratifying to know that policy makers have already done more in the past several months to address this crisis than the Depression-era leaders did in three years. This alone should provide some confidence that, despite difficult times ahead, a recovery is indeed on the horizon.